Pardon the language… but it is a quote. Well, I’ve realised my husband is right and I am probably an idiot as I book in too many meetings when we travel. Below is an updated itinerary as of today, as some meetings changed overnight, but who knows, if I can squeeze any more in, I’m sure I will find a way! 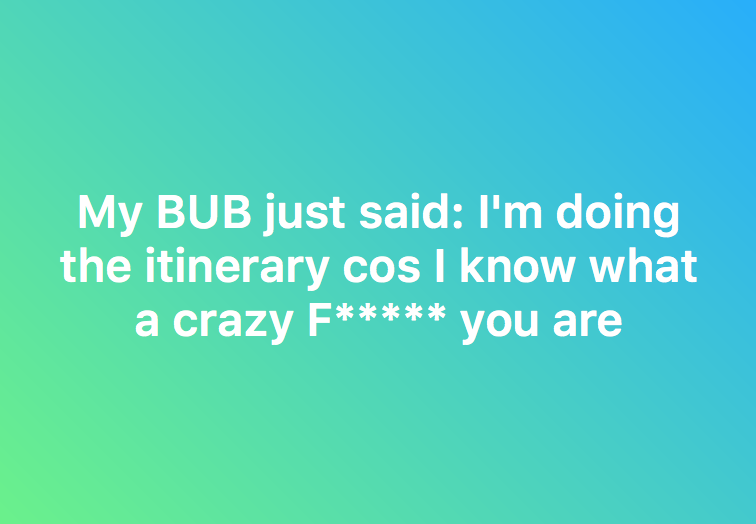 We are departing later today for 4 nights on London, to attend WDC11 (WDC stands for the World Dementia Council), and as the only Australian to be a fun and FULL member of the Council (necessary edit from my BUB, even though I like to have fun, full is what I meant!!) , and also representing DAI, it is really important to attend. Part of the reason I add in so much DAI work on all of my travels is in part because on some of our trips, my husband and I have to partly or fully self fund, and this is another one of those times. As yet, it is not the reality that DAI has the funds for many things at all, and others still do not seem to want to support DAI. A friend of mine easily raised over $80,000 in a few days to produce a cookbook, yet our last Crowd-fundraising event, DAI only managed just over $1000. I guess the world is not yet used to the reality people with dementia can still function, albeit with a lot of support. Our sons both say it’s ok, as if it means if they get dementia, they might get a better deal than we all currently get, which has to be a good thing! It’s lucky we have mildly altruistic and very kind sons as well! It is also my youngest sons 27th birthday today, so even though we are going away later today, at least we could have breakfast with him, and although he is not so well haven woken up with a dose of the flu, as well as having some serious spinal injuries he is trying to manage without a surgeon’s knife intervening, he and Daisy the grand-dog will look after the house while we are away! Anyway, here is my (therefore our) crazy and most recently updated itinerary! Oh, and we are now staying one more night than originally planned! There is a great movie, The Gods Must Be Crazy, actually one of my favourites, but in my case, I think maybe The Gods Made me Crazy?! Or the Faeries??? Ps. Pardon the language in the image from a post on Facebook a few days ago, but it is an actual quote! ← Is it fair for everyone to be paid for their expertise? Good luck & safe travels. Wow!!! Dear Lesley, I’ve been thinking of you a lot this year, wondering how you’ve been. I couldn’t find your email, but thanks to you commenting have it again! I’ll be in touch via email ASAP. I’m exhausted just reading that Kate. All the best to you and Pete for your trip. Wow Kate – busy, busy, busy!!!! !